Let the Practice Games Begin! Now the student learns ways to make the same notes sound different by using the bow more skillfully. Exactly how does one make a song sound quieter or louder, and at what point in the song? This book covers how to do this, and introduces and explains those Italian terms found every where on music sheets, to help the student select the correct speeds. 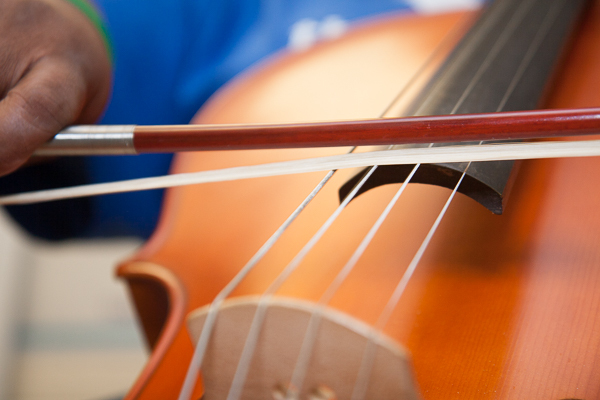 Beginning elements of musicality are introduced, such as breathing, relaxed bow control, and in-depth mechanics on the mechanism of producing sound with stringed instruments. 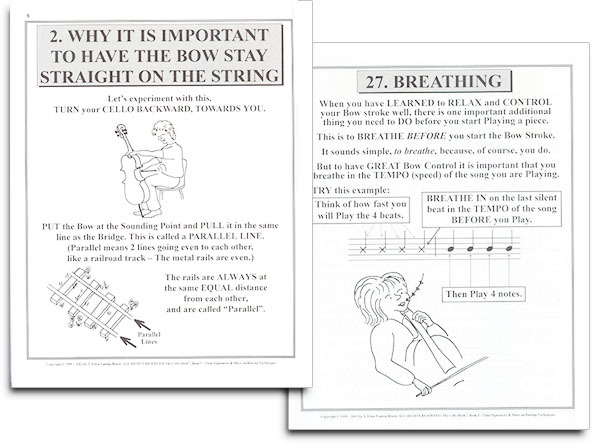 The clarity and simplicity of the pictures make The Cello Book a joy for anyone to use! What are the three things that control the sound of the cello? Includes lots of cello sheet music! Your child is not being confined to any type of music, but playing a wide variety of different types. © Copyright 2001-2019 by S. Eden Vaning-Rosen. All Rights Reserved. 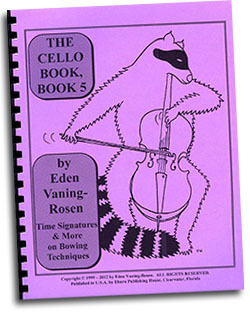 The Raccoon Figure holding the Violin & The Violin Book are Trademarks owned by S. Eden Vaning-Rosen. Original website design by Mike Mannakee.